Mesopotamian Ziggurat at Ur, c. 2100 B.C. Ziggurats were a form of temple common to the Sumerians, Babylonians and Assyrians of ancient Mesopotamia.The earliest examples of the ziggurat date from the end of the third millennium BCE and the latest date from the 6th century BCE. 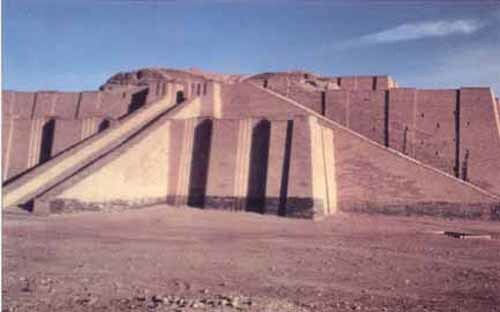 Built in receding tiers upon a rectangular, oval, or square platform, the ziggurat was a pyramidal structure. Sun-baked bricks made up the core of the ziggurat with facings of fired bricks on the outside. The facings were often glazed in different colors and may have had astrological significance. The number of tiers ranged from two to seven, with a shrine or temple at the summit. Access to the shrine was provided by a series of ramps on one side of the ziggurat or by a spiral ramp from base to summit. Notable examples of this structure include the Great Ziggurat of Ur and Khorsabad in Mesopotamia. The Mesopotamian ziggurats were not places for public worship or ceremonies. They were believed to be dwelling places for the gods. Through the ziggurat the gods could be close to mankind and each city had its own patron god. Only priests were permitted inside the ziggurat and it was their responsibility to care for the gods and attend to their needs. As a result the priests were very powerful members of Sumerian society. There are 32 known ziggurats near Mesopotamia. Four of them are in Iran, and the rest are mostly in Iraq. The most recent to be discovered was Sialk, in central Iran. 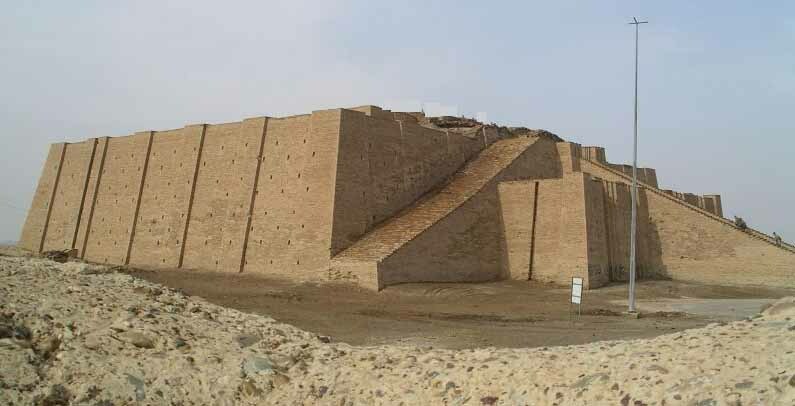 One of the best preserved ziggurats is Choqa Zanbil in western Iran, which has survived despite the devastating eight year Iran-Iraq war of the 1980's in which many archeological sites were destroyed. The Sialk, in Kashan, Iran, is the oldest known zigurrat, dating to the early 3rd millennium BCE. Ziggurat designs ranged from simple bases upon which a temple sat, to marvels of mathematics and construction which spanned several terraced stories and were topped with a temple. 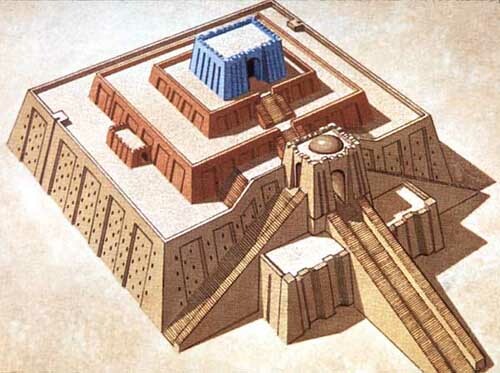 An example of a simple ziggurat is the White Temple of Uruk, in ancient Sumer. The ziggurat itself is the base on which the White Temple is set. Its purpose is to get the temple closer to the heavens, and provide access from the ground to it via steps. 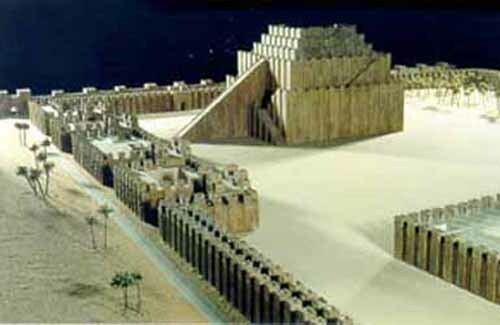 An example of an extensive and massive ziggurat is the Marduk ziggurat, or Etemenanki, of ancient Babylon. Unfortunately, not much of even the base is left of this massive structure, yet archeological findings and historical accounts put this tower at seven multicolored tiers, topped with a temple of exquisite proportions. The temple is thought to have been painted and maintained an indigo color, matching the tops of the tiers. It is known that there were three staircases leading to the temple, two of which (side flanked) were thought to have only ascended half the ziggurat's height. Etemenanki, the name for the structure, is Sumerian and means "The Foundation of Heaven and Earth." Most likely being built by Hammurabi, the ziggurat's core was found to have contained the remains of earlier ziggurats and structures. The final stage consisted of a 15 meter hardened brick encasement constructed by King Nebuchadnezzar. It has been suggested that the ziggurat was a symbolic representation of the primeval mound upon which the universe was thought to have been created. 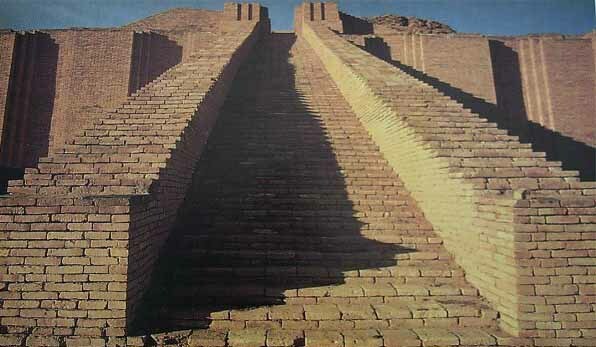 The ziggurat may have been built as a bridge between heaven and earth. The temples of the Sumerians were believed to be a cosmic axis, a vertical bond between heaven and earth, and the earth and the underworld, and a horizontal bond between the lands. Built on seven levels the ziggurat represented seven heavens and planes of existence, the seven planets and the seven metals associated with them and their corresponding colors. Joseph Campbell in his Masks of God books says that there is archaelogical evidence supporting a direct link between Mesopotamian ziggurats and the pyramids of Egypt. Campbell also states that from Egypt, the Mesopotamian culture was passed on almost simultaneously on two separate fronts to Crete and India. From India it reached China and from there it crossed the ocean to the pre-columbian societies of Central and South America, which could explain the similarities between ziggurats and Mayan pyramids. Campbell further explores the geometry of the ziggurat and its philosophical and spiritual repercussions. According to Campbell, ziggurats first appeared during a sudden scientific and philosophical golden age where such other discoveries were made such as the invention of the wheel, the discovery of the calendar and astronomy, as well as the invention of the written word. For Campbell these are all related. The Earth needs 365 days to make a single revolution around the Sun, which is also an approximation of the number of degrees in a circle. Ziggurats, like all pyramidal structures, have a square base which could be encompassed within a circular area. The square base theoretically represents the additional five days. The five days can be seen in the four points of the square as well as the fifth point in the middle, which is the point of the square's equilibrium as well as the point of equilibrium of whatever circle that encompasses it. The fifth point represents the bridge to heaven represented by the circle, a universally considered symbol for infinity and perfection, and the terrestrial world in turn represented by the square. The highest point of a pyramid is a projection of the square's center point. This can be interpreted as the earth's highest point being heaven's lowest. There are examples of the philosophies surrounding the ziggurat in all major ancient civilizations of the world, which Campbell has affirmed is no accident. Examples can be observed in the seven leveled Chakra system of India as well as the dualistic Yin-Yang of China. 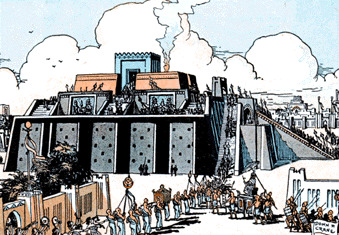 The Biblical account of the Tower of Babel may be based on Mesopotamian ziggurats. The ziggurat style of architecture continues to be used and copied today in many places of the world. One example would be the University of Tennessee central library, in Knoxville, Tennessee. Another would be the ziggurat by the river, near downtown Sacramento, California, used as corporate office space. After 20 years of digging, Austrian archaeologists say they have determined the design of a Mesopotamian ziggurat - a temple tower - built by King Nebuchadnezzar some 2,500 years ago. The temple tower consisted of seven terraces built of millions of mud bricks and rose 231 feet, the scientists say. It probably was similar to the many ziggurats built by Nebuchadnezzar, the ruler who ordered the destruction of the ancient Jewish temple in Jerusalem, they add. The temple of Borsippa, 75 miles south of Baghdad, was constructed atop the ruins of a smaller tower from the second millennium B.C. 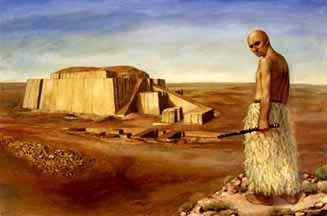 Nebuchadnezzar's temple was dedicated to Nabu, the god of science and learning in Mesopotamia and the king's protector. Wilfrid Allinger-Csollich of the University of Innsbruck said that of all the temple towers built during the Nebuchadnezzar's 40-year reign, the Borsippa ziggurat has best survived the ravages of time. The Austrians removed thousands of tons of debris from the mound that gradually built up around the tower over the ages and uncovered most of the ziggurat's remains, which still rise to 172 feet. The work revealed the tower's exact dimensions, Allinger-Csollich said. "We did not use high-tech, but rudimentary means. We just counted the number of bricks," he said. The square bricks used by Nebuchadnezzar had standard dimensions -- 13 1/4 inches on each side and 3 1/4 inches in depth. The Austrians used mechanical shovels to reach the foundation, which they measured at 297 by 297 feet. More than 1 million fired bricks were used for the first level's 3.3-foot-tall outer wall, Allinger-Csollich said. Given the Borsippa tower's height of 231 feet. The builders filled the inside of each level with tens of millions of unfired bricks held in place with cedar beams brought from Lebanon. The Austrians determined the tower had three staircases and are in the process of calculating how many steps each had. Their picture of the temple's exterior is almost complete. The first two levels were covered with bitumen and were black. The third, fourth and fifth were decorated with blue-glazed bricks and possibly adorned with bulls and lions. The sixth and seventh terraces, close to the sanctuary, were wholly made of mud brick. For cultic purposes the Mesopotamians thought mud to be the purest of substances. On top was Nabu's residence with rooms for servants and priests and wings for his wife, Tachmitum, his children and daughters. There must have been a big library of cuneiform tablets. Among the finds are several tablets and a foundation stone with inscriptions detailing why and how Nebuchadnezzar constructed the tower in Borsippa. One text says the king wanted the Borsippa built on the same design as that of the Tower of Babel, of which only the foundation survives in Babylon seven miles to the north. Another text quotes Nebuchadnezzar as declaring that Nabu's tower should reach the skies and be no less in grandeur than that of Babel, which was dedicated to the god Marduk.